Pretoria: Hashim Amla and Rilee Rossouw smashed quick-fire centuries as South Africa crushed a profligate West Indies by 131 runs in a rain-affected fifth and final one-day international on Wednesday. The pair put on 247 for the third wicket, equalling the South African record they had set in the second match of the series in Johannesburg, as the Proteas piled up 361 for five in their allotted 42 overs. It was the highest ever ODI score in a 42-over or less innings as South Africa made hay on a flat wicket and against an equally flat bowling attack to win the series 4-1. Rossouw had a relatively slow start but accelerated to bludgeon nine fours and eight sixes for his 132 from 98 balls. Amla was equally devastating as he top-scored with 133 from 105 deliveries. West Indies lost forceful opener Chris Gayle to the first ball of their reply and despite some lively cameos, including a half-century from Marlon Samuels, were always behind the rate and were bowled out for 230 in 37.4 overs. After 16 overs were lost due to rain, West Indies won the toss and elected to bowl in the final match for both sides before they head to the World Cup in Australia and New Zealand. South Africa made a brisk start but when fit-again wicketkeeper Quinton de Kock (four) went early and Faf du Plessis (16) fell with the score on 59 for two after 10 overs, consolidation was needed. Amla and Rossouw did not hang around, though, as they punished poor bowling by the tourists who erred on both sides of the wicket and never managed to find the right length. 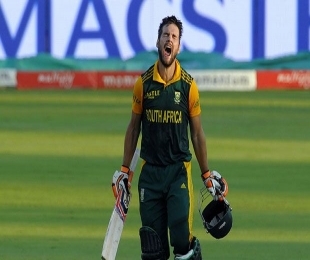 The visitors’ reply was in trouble from the first ball and never recovered as seamer Wayne Parnell finished with figures of four for 42 in nine overs. Samuels top-scored with 50 from 47 balls before giving his wicket away with a wild slog that ended with his middle stump pinned back.